P.S. you can see my 2nd post for today HERE!! This is such a gorgeous card!! I absolutely love it!! the embossing is just perfect for it too!! Crossing my fingers for your stamps!! Hope to win these stamps. I really need some for my collection! Love it!!!! Those flowers are just beautiful!!! I need to ask my grandma to teach me how to make these instead of having her make me lots of them!!! The card is amazing.. Love it.. TFS..
Wow, the card is amazing..but then again, your whole blog is amazing!! I love your stamps! I meant to say i love the look of your stamps! Do you think you will ship international? I'm in Australia. Such a beautiful cake. I love the flowers. Thanks for a beautiful project! I love the way you decorated the cake. My daughter is getting married in June and she has decided that she wants me to make her invitations, she has picked out that very cake. Thank you for giving me the idea on how to decorate it!! She'll love it!! Beautiful card... I know how to crochet!!! but am so addicted to paper that have not done so, but you are inspiring me to balance!! Awww! Such a cute card, and I always love your videos! Thanks for sharing! Absolutely darling!! The crocheted flowers make it so very special. What an awesome creation...Love the colors and embossing. You just gave me a great idea for a card I need to make for the end of this month. Thanks so much for sharing. Keep up the Creativity. Your card is spectacular, and just love those flowers!! Your card is so beautiful!!! For a moment, I thought that it was a real cake, maybe I need glasses! This is such a precious , precious card. You always do so good. I have not talked to you in so long. I had kind of cut back on looking at sites. Hope you are doing well. Cute Card Thanks for doing this!!!! Love this card ! Thank you for sharing with us. This is adorable..I'd love to know how to crochet like your "bestie"! Thanks for sharing. What a beautiful card!! Love all the details on it, those flowers are just sooo pretty, TFS!! I really like your card. Great job! Thanks for the awesome stamp giveaway! This is absolutely beautiful! I love the flowers! Emma that is so adorable and Nikki's flowers are to die for! What a fun cake! Oh and now I want cake for breakfast! What a great card! I love the color combo and the flowers are fantastic! Great card Emma! Love the embossing and the flowers! Wow...this is gorgeous. I love the embossing and stitching. Thanks for the video....beautiful! Love it, the video is great. Thank you. Super cute cards as always emma. I love your new stamps..
Beautiful card and super cute flowers!!!! EMMA...EMMA...EMMMA, YOU rocked it again, I love this card and must make it, does Nikki sale her flowers, I would love some! What a beautiful card!!! I can see using this design for a wedding card as well. I love the card. I especially love the crochet flowers. Will your friend be selling the crochet flowers? I am new to the blogger world, but I just wanted to say this card is adorable!! LOVE IT! It is so pretty! And yes, Nikki, please put the flowers in your Etsy! Waooo what a beautiful card Emma.... lovely..
Emma, you always do such beautiful work! Love this-so different from the typical birthday greeting! Thanks for sharing! Emma, AS usual that card is so BEAUTIFUL. I LOVE it. Those flowers Nikki did are AWESOME.. What a great card. Very pretty. Love the colors. What a great card! I love the colours! Cool card! Love using the Gypsy, gonna follow for sure! Love your cake I had to look at it twice to make sure it wasn't real. That is gorgeous. Great details. Your card is so adorable. Awesome and generous giveaway. Oh WOW Emma, I gotta say I love everything you make but this has to be one of my Favorites! The colors and embossing are perfect and the sentiment oh!TFS!! Your card is absolutely adorable!!! Love, love, love your projects and really love your new stamp sets! Gorgeous. Love the flowers. TFS. Man that looks so dementional. Just love it. Thanks for sharing. That is just the best cake card EVERY! I love all the detail. Great giveaway also. 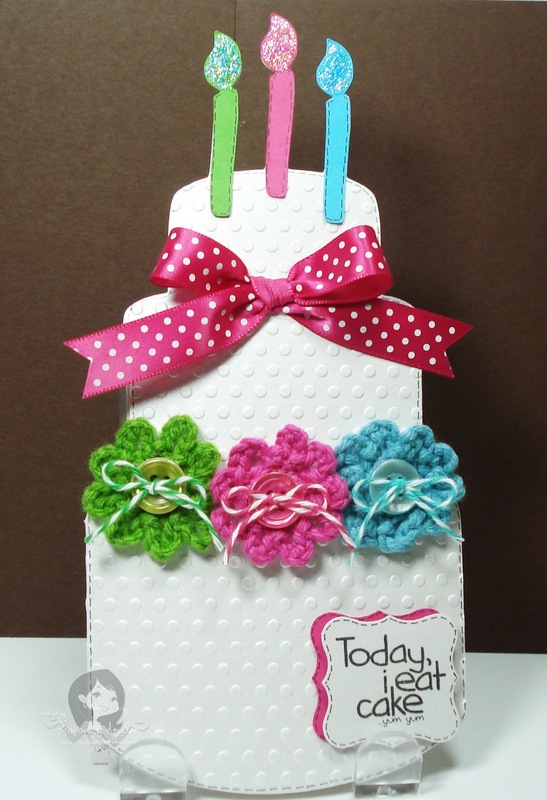 Your card is soo sweet but I have to admit, the crochet flowers take it to the top! What a great idea. So unique I love the card! I hav an anniversay party coming up I may try to make a version of it. Thanks for sharing. Love the cake and the embossing really makes it really nice. I have made the cake before but never had made any candles on it what a cute idea. Tell your friend the flowers are so cute and where can we get some. I LOVE your card! Thanks for sharing! Such a beautiful cake card. Love it as I always love your projects. What an awesome card! Love those little crochet flowers! Great Idea for a party. A birthday party is not complete without the cake. Those crochet flowers are cute. Emma, you never cease to amaze me! Love this card...so adorable! And I am totally in love with flowers!!! What a great card, I love it!, This is a great HOP, so fun. Thanks for having a great giveaway! Your new stamps are AWESOME!!!! Oh my goodness! That is just too cute!!! Thanks for sharing! Love your card and the flowers that Nikki made. Thanks for sharing your creation with us. wow this card is beautiful and with a few tweaks could so easily become a wedding card! great job! TFS! Love the classy look to your card!!! Your card is beautiful. So many layers to look at. Great Job. AWESOME card, did you emboss just the front? Love all you stamps. AAAA-ma-zingggg....this is an amazing card. I love love love it. Amazing! I love it. TYFS. I love the colors! And the way you used your gypsy! I just got the Wild Card cartridge! I'm so excited to start using it! I can't wait for your stamps to come! I ordered the I believe in Leprechauns stamps. After all, I am a little Leprechaun myself! Although you indicated the cake card is simply I found courage to try it on my Gypsy! How beautiful this card is. I always love your cards! The cake is super cute! Beautiful card! I love the crocheted flowers...my niece has promised to make some for me! Such a cute card! I LOVE the added touch of the crochet flowers! Love the Cake card and Nikki's flowers and package are so cute too. Thanks for the chance to win your stamp set. What a beautiful card Emma! I love that you used a Cuttlebug folder to add texture! Thanks for a chance to win. I'd love to have one of your stamp sets! Emma, such a gorgeous card. Nikki, those flowers are beautiful, can't wait to order some. Your card is gorgeous! You are so talented, thanks for sharing. Emma! your card is perfect, it really does show off Nikki's flowers fabulously! alway looking forward to your next creation! OMGoodness Emma!!! That has to be one of the most beautiful cards ever!!! I love it! loving all the creativity and energy,Thanks for sharing !! Such a clever card. Nikki's flowers are beautiful also. Thank You for being in the hop and for chances to win great prizes. Emma, this card is absolutely wonderful! LOVE IT!! Leaving the cake white really set off the other colors. How pretty! Thanks for sharing!!! So very unique! Love the colors! BEAUTIFUL! Love the dotted background and those crocheted flowers are so pretty! I love the card, TFS! I just got a gypsy and you make it look so easy. Love the tutorial and love this birthday card. cant wait to buy some of those flowers from your friend. Emma this is so beautiful! I get so many good ideas from you, everything you do is amazing. Just wantedto say that I luv the card and those flowers are adorable! tfs. This cake is amazing--I can taste it's sweetness! What a cute cake! Thanks for sharing Emma! Another darling card!! I love the colors and the flowers are amazing! OMG... yet another great card! I love all the details, those flowers are fantastic! Love that card. I have wanted that cart! Thanks for sharing! Love your card. The crocheted flowers are super cute on it. TFS. Lovn this cake card, and the colors, and Yes ok, Nikki's flowers too. I really love how bright this card is, and the sentiment is perfect! Anything from you is just perfect. Wonderful Job Ems! What a beautifrl card!! I will have use your idea. FABULOUS Emma! Love the colors, texture and those yummy flowers! Would love to win your stamps too! This card DOES look good enough to eat, great job...and when did you say Nikki will have the flowers ready? lol another inspirational project from Emma, thanx. love this card its soooooooooo cute!!! thanks for sharing. Your card is beautiful. Thank you for sharing it with us. What a beautiful cake card. Thanks for sharing another great card. So cute Emma. Love that sentiment and I should crochet flowers. Those would be inexpensive embellishments. Beautiful card. Love the cake card. So cute. Those flowers that Nikki made are ABSOLUTELY amazing. The card is awesome and I wish I could make cards half as good as your simple cards, Emma. Adorable. Thanks for sharing and for the blog hop. Such a cute card!!! Thank you so much for sharing! this card turned out so nice. thanks for sharing. WOW - love the card! That cake looks yummy! TFS! Eeeek! That card is sooo sooo cute! Looks like I need to invest in the wild card cart, and then I need to learn to crochet, lol. Those flowers are absolutely perfect with this fun card! Gorgeous as always... you rock! Thanks for the chance to win! wow so cute! i love your blog! Love your creations, Emma! The flowers are so special!! Wish I could crochet! Love the card, Emma, and the flowers are soooo cute! Cute cute card I love the flowers. Such a beautiful card! I love the flowers. Thanks for a beautiful project! Your project is soooooo cute! I love your stamps! You are so inspiring! I love your cards, Emma! Thanks for the chance to win one of your sets. I am saving up to get them all. Love gypsy videos! I just got one for Christmas!!! Very cute, love the stamps and crochet flowers, tfs. Love the flowers! They really make the card pop! This card is gorgeous! It looks just like a real cake! So pretty. Thanks for sharing! What's not to love about you card:) The colors really stand out. I just love it! That is an adorable card! You could totally make that for a wedding card! This is adorable! Thanks again Emma for an incredible idea! Love your site and inspiration! Emma, what a beautiful cake. I am sure Alex will love it. Wow. Fantastic job on this! Love it! Oooohh! I love that card! It's beautiful! OMG, that is a beautiful card!! Your card is great and I love the flowers too. Thanks for sharing.